By the lights of Wall Street and its media megaphones, therefore, global demand for commodities and oil is purportedly rebounding and a reflationary cycle of growth is again underway. Apparently, its time to buy the dip again because the world economy has gotten back into its growth groove. No it hasn’t. What we have here is a Gary Cooper rebound. That is, another unsustainable upward blip of the fundamentally false global credit bubble. But the latter is no more on the level than was Joseph Stalin’s new Soviet paradise. This time, of course, capitalism is being supplanted by printing-press happy central bankers rather than tonnage toting commissars reinforced by firing squads. But the end game is much the same. To wit, when the state tries to over-ride the laws of the market and sound money, the experiment will eventually end in tears. We can’t be too far away. The BOJ has gotten so desperate, for example, that it is apparently fixing to double down on its leap into negative interest rates on central bank deposits by extending NIRP to its commercial bank funding facility. That is, its going to pay commercial banks to make loans to private sector firms and households which are already buried in debt. At more than 450% of GDP, in fact, Japan’s total credit outstanding towers well above the rest of the world. No matter. 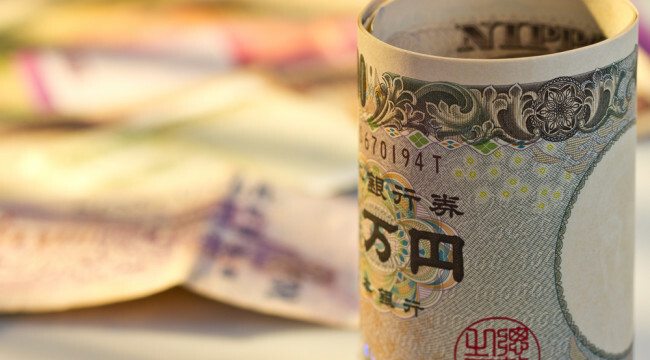 The madcap money printers at the BOJ have already bought up every Japanese government bond that can be pried loose and own nearly 50% of Japanese issued ETFs. And now comes word that the BOJ has bought so much stock through ETFs and directly that it has become a top holder of most of the stocks in the Nikkei 225. Needless to say, the Japanese bond and stock markets are not even slightly on the level. They are incendiary artifacts of a central bank that has gone berserk and getting more desperate by the day. Yet the BOJ is hardly an aberration. The affliction is nearly universal as Draghi demonstrated last week and as the Fed will reaffirm this week when it effectively perpetuates ZIRP into its 89th month. So rather than discounting the unmistakable signs of economic weakness and swooning profits everywhere, the casino gamblers keep repairing to any sign that one or another of these rogue central banks will goose the financial markets with one more round of stimulus—-or delay in the inexorable path toward normalization. The flavor of the moment this week is that the BOJ will soon embark on the form of helicopter money referenced above. But that has been mightily reinforced by this morning’s Cramer/Goldman proposition that the global economy is in a renewed upswing because the red suzerains of Beijing have now injected a massive new round of stimulus into China’s faltering growth machine. Well, that they did. 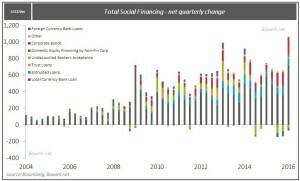 It now appears that total social financing in Q1 hit 7.5 trillion yuan with a “T”. In plain USD’s that implies a $4.5 trillion annualized rate of credit expansion. It also settles the case. Beijing has completely lost control of the Red Ponzi and in contradiction of every one of its public pronouncements about pro-market reforms and a smooth transition to a consumption and services based economy, it has unleashed the printing presses like never before. But with $30 trillion of debt already smothering the Chinese economy, generating new credit at a rate of nearly 40% of GDP is tantamount to a death wish. It is simply inflating financial bubbles faster than can be tracked, and eliciting yet another borrowing and construction surge in an economy swamped in excess capacity and white elephants. Accordingly, during March Chinese steel production set an all-time record, cement production soared and the “iron rooster” was temporarily back in business. New home sales jumped 64pc in March from a year earlier. House prices have risen 28pc in Beijing, 30pc in Shanghai, and 63pc in the commercial hub of Shenzhen. The rush to buy has spread to the Tier 2 cities such as Hefei – up 9pc in a single month. “This looks like an old-styled credit-backed investment-driven recovery, which bears an uncanny resemblance to the beginning of the“four trillion stimulus” package in 2009. The consequence of that stimulus was inflation, asset bubbles and excess capacity. We still think that this recovery will not last very long,” she said….. The signs of excess are visible everywhere as the Communist Party once again throws caution to the wind . Cement production jumped 24pc in March and infrastructure investment rose 19pc. Yang Zhao from Nomura said the edifice is becoming more dangerously unstable with each of these stop-go mini-booms. “Structural problems and financial imbalances are worsening. We believe this debt-fueled growth is not sustainable,” he said. Nomura said the law of diminishing returns is setting in as the economy nears credit exhaustion. The ‘incremental credit-output ratio” has deteriorated to 5.0 from 2.3 in 2008. Loans are losing traction and the quality of investment is falling. That’s right. China’s precisely calibrated GDP grew by $180 billionduring Q1, even as its outstanding debt soared by upwards of $1.055 trillion. So it took $6 of new borrowing to coax another dollar of dubious GDP—-that is, more empty roads, train stations and apartments—–out of the Red Ponzi. But what it actually did was trigger another round of Chinese speculation in commodity stockpiles, industrial inventories, real estate and other assets. That impulse, in turn, cascaded through global commodity markets, causing a modest rebound in beaten down prices and thereby reinforcing the Wall Street meme that global reflation is underway. The chart below says otherwise. At the heart of the Wall Street rebound from the February 11th lows was the 55% gain in crude oil prices. The whole proposition was that the Doha disaster didn’t matter because global crude oil supply, at length, was beginning to bend downward and that by early next year the market would be back in balance. This, in turn, was to pave the way for prices above $50 and a rebound in the entire commodity and materials complex. China is hoarding crude at the fastest pace in at least a decade, filling inventories at a time when oil futures remain about 60 percent below where they were just two years ago. The nation added 787,000 barrelsa day to stockpiles in the first quarter, the most for the period since at least 2004 when Bloomberg started calculations based on customs data. Its imports climbed in March from countries including Iran, Venezuela and Brazil. 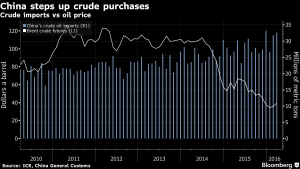 “We’ve seen crude buying in recent months coming from a very broad range of sources, more coming from Latin America and more from Europe,” said Richard Mallinson, an analyst at Energy Aspects Ltd. in London. Shipments are being boosted by so-called teapot refineries and may also be advancing in preparation for the end of refinery maintenance programs in China, he said. Operating rates at teapot refineries in eastern Shandong province rose to about 52 percent in the week to April 22 as two plants completed maintenance and restarted production, according to industry website Oil.chem.net, which surveys 32 of the refineries. Here’s the thing. Global liquids demand in Q1 according to the international energy agency averaged 94.82million b/d compared to 93.58million b/d during Q1 2015. So demand was apparently up by 1.24million b/d (1.3%), but self-evidently much of that was due to backdoor inventory accumulation through China’s teapot refinery complex deep in the maw of the Red Ponzi, not growing final demand. In fact, China’s inventory accumulation accounted for two-thirdsof apparent global demand growth in Q1. So on the margin, oil got a bid because the punters are watching the supply curve, but assuming that “demand growth” is a given. To the contrary, global oil demand is on the precarious edge of rolling over. Most of the apparent demand growth of 800k b/d in Q4 and 1.2 million b/d in Q1 reflected the final burst of credit-fueled inventory accumulation in the Red Ponzi. But as has been demonstrated repeatedly in the copper, iron ore, cotton and other commodity markets, when the Chinese speculators commence a destocking cycle——–then, look out below! What actually happened in Q1, in fact, was that world trade volumes collapsed by double-digit rates in China and throughout the East Asian export complex. What comes next, therefore, is global oil “demand destruction” as economic activity continues to ebb. The modest production drop in the US shale patch expected in the months ahead will be no match for the latter. There is no reflationary cycle just ahead. The commodity complex will soon reverse. CAT’s sales have declined for 32 straight quarters for a reason. To wit, the massive CapEx spending boom elicited by the central bank driven credit bubble of the last two decades is over and done. There is enough used big yellow machines floating around the global used machinery markets to last for a decade. Stated differently, the global commodity and CapEx bottom’s not in. It’s not even in sight. More importantly, this Gary Copper rebound has already reached its sell-by date. Jim Cramer to the contrary notwithstanding, the more prudent thing to do would be not to back-up-the-truck, but to sell it. Today brought still more evidence that the entire global casino is definitely not on the level.